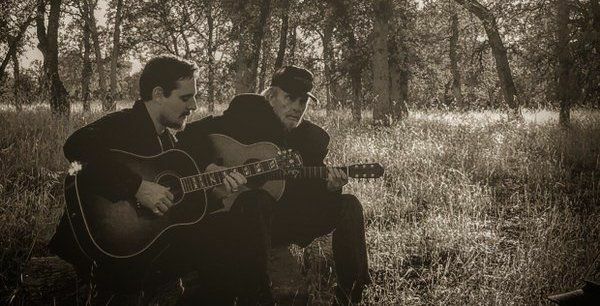 Merle Haggard and Sturgill Simpson. Photo by Ben Haggard. By Scott Cunningham // A contemporary of Cash and Jennings, Haggard helped define country music. And a special Portland connection, band member Renato Caranto. Country music icon Merle Haggard passed away today on what was his 79th birthday. "A week ago dad told us he was gonna pass on his birthday, and he wasn't wrong. A hour ago he took his last breath surrounded by family and friends. He loved everything about life and he loved that everyone of you gave him a chance with his music. He wasn't just a country singer. He was the best country singer that ever lived." Always one to tour, Haggard had been forced to cancel several dates earlier this spring. He was scheduled to be one of the headliners at the Oregon Jamboree Music Festival in July. Portland sax player Renato Caranto has been a member of Haggard's band for just over two years and told me this afternoon that, "Every time we perform I'm always amazed at the people who show up, all the love for him. It's been amazing to be a part of that." Caranto is originally from the Philippines and said that Haggard was always asking about his family, even calling Caranto after a major storm struck the islands, asking if he could help in any way. "Every time we get together, he makes me feel like one of his family. What an amazing friend," Caranto says. "We really connected from the outside to the inside, he cared about every performance." Haggard's family fled dustbowl Oklahoma in 1935, settling in California and his story was one of triumph against long odds. After spending time in San Quentin prison, where he saw Johnny Cash perform, Haggard rose to the pinnacle of American music. Always a champion of the underdog, Haggard told GQ in 2012 that "I sometimes feel like I'm standing up for the people that don't have the nerve to stand up for themselves." Chris Heath's GQ profile of Haggard is well worth the read for anyone wanting to understand more about Haggard and his music. The Country Hall of Fame and Kennedy Center Award recipient recorded a whopping 40 No. 1 singles over the course of his six decade career. I'm a Lonsesome Fugitive was his first No. 1 hit in 1965, but it was 1969's Okie From Muskogee that catapulted Haggard to the forefront of country music. Eschewing the contemporary Nashville formulas of the time, Haggard's music was always characterized with a rough, gritty sound that harkened back to his upbringing and the rawer sounds emerging from Bakersfield, California, where he had made his home. He eventually settled near Lake Shasta with his fifth wife Theresa. On Twitter, Charlie Daniels wrote, "Country music has suffered one of the greatest losses it will ever experience. Rest in peace Merle Haggard."